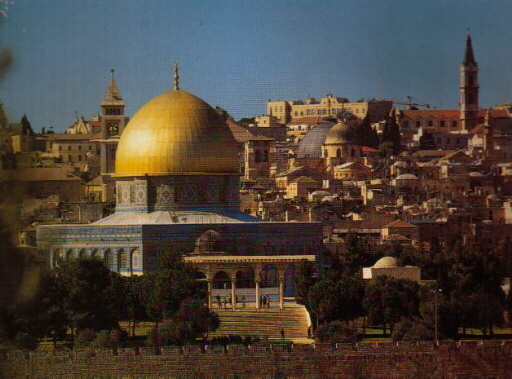 This mosque, the Dome of the Rock, was built in 691 AD. This mosque was built by Abd El Malik ibn Mirwan, the Omayad Khalif. One of the main entrances to the Mosque encased in marble slabs and beautiful Persian tiles. The internal side of the dome is wood lined and richly decorated with stucco and is painted in Red and Gold. 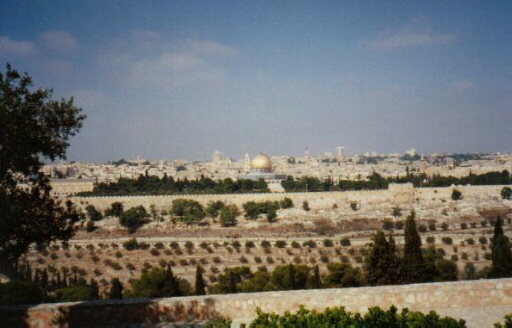 The Dome of the Rock photos are shown because it is a magnificent mosque in Jerusalem. However we at ASKTHEBIBLE and all Christians do not consider the Koran as the inspired word of God. We believe by faith, that salvation, a pathway to God, is only through His Son, Jesus Christ son of the Living God and Him alone. See John 14 verse 6. However, we consider all people have a right to worship and follow their own religion in peace. We deplore persecution of those men and women who turn to Christ or other religions and suffer as a result of their faith. The Bible teaches that God gives every man and women a choice. Freedom to practice your Religion without fear is a basic right for a human being that must be honoured.